My interest in jewellery and silversmithing started with seeing pieces of silverware that my father used to buy and sell. Being able to look closely at some of the pieces led me to be interested in design and manufacture. After leaving school, I started work for Stenigot Estates and trained on a farm management course at Louth College. This gave me a basic knowledge in machinery maintenance. In 1988 I was able to change direction and start working at the Lincolnshire Antiques Centre, which helped me to direct my interest of antiques and their design. In 1989 I started my classes at Grimsby Institute studying jewellery and silversmithing. Over the next few years I continued to study at all the jewellery classes there were and when I had completed all the courses I continued studying on my own developing techniques such as polishing, finishing and engraving. During this time I was slowly building and equipping my own workshop. I now have a well-equipped studio, which helps me to achieve my individual designs, commissions and repairs. 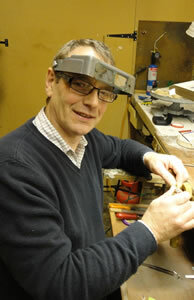 For the last 6 years I have been teaching on a part-time basis Jewellery and Silversmithing at Grimsby Institute. A profile of Andrew Poole and his work for the 25th anniversary of the Contemporary Craft Network. Contemporary Crafts Network - Andrew Poole from Graham Cooling on Vimeo. We run silversmith workshops throughout the year. Please contact us for more information or look at our Facebook page for previous courses.